Nissan Altima is a premium class mid-sized sedan car designed for a luxury executive drive journey experience for customers. It provides a sleek elegant display appeal with keen noticeable attention for all ages of customers. The latest Version of Nissan Altima 2019 will be a true iconic masterpiece creation design launching soon for customers on 28th March 2018 with a stunning appearance to show its bold dynamic presence in the market. This trendy and smart sedan will be an excellent family car ideal for a pleasurable on-road journey and will stand beyond the competition with conventional midsized rivals like Toyota Camry, Honda Accord, Hyundai Sonata, Mazda 6, Kia Optima, Ford Fusion, Volkswagen Passat, and Chevrolet Malibu. 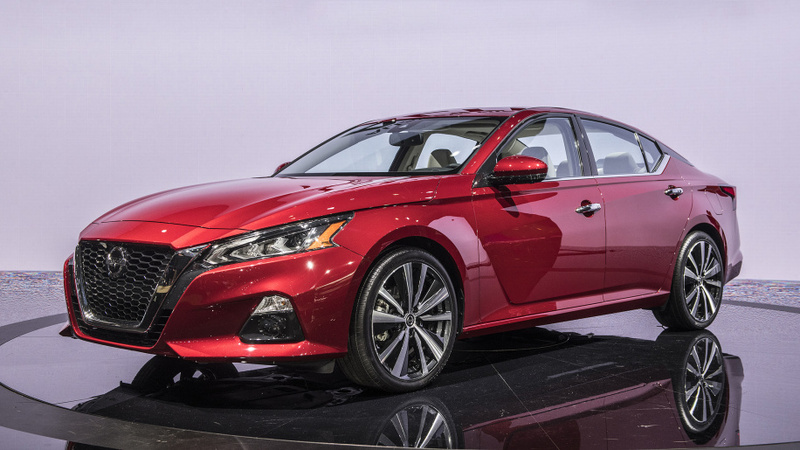 All New Nissan Altima 2019 will be a handsome stunning 4-door right-hand sedan car built with a robust masculine aerodynamic design structure to exhibit a solid piece of reputation and will also leave a sound lasting impression on customers at a first sight glance. The exterior design will simply provide a glamorously stylish look for customers with glittering accessories such as projector type halogen headlights, Daytime running lights, V-motion 2.0 concept chrome horizontal bar metallic black grille, under spoiler front fog lights, lower emblem grille, front side bumper, power side view door mirrors with LED turn signal indicator, and 18-inches aluminum alloy wheels. On the rear side, it will show a nice attractive catchy design look added with a shark fin rear radio antenna, LED Stylish taillights, rear side bumper, dual exhaust tailpipes, and the dark tinted rear windscreen for a bolder contemporary attitude. The exterior body colours will be added as scarlet amber, storm blue, deep blue pearl, super black, gun metallic, brilliant silver, pearl white, and glacier white. Interior Cabin Design will offer a luxurious yet spacious 5 seating comfortable capacity. The seating will be finely stitched with a perfect combination of beige and charcoal leather fabric for an enhanced display look and also give an extreme sense of legroom and headroom space for passengers. The rear side compartment will be designed with vast extensive cargo loading storage accommodation with easy opening and closing tailgate. The front side dashboard cockpit panel will give a well refine fancy appeal equipped with advanced key features such as Nissan Intelligent Key with push start button ignition, Nissan Navigation System, active driver assist display, apple car play, android auto, 7.0 inches multi-touch control color monitor, rearview monitor, Bluetooth hands free phone system, dual-zone automatic climate control, air-conditioning, power door locks and auto locking feature, intelligent cruise control, tilt and telescopic steering column, AM/FM CD Audio system with choices of 5.0 and 7.0 color monitor, and 9 speakers Bose premium audio system. The Driving Safety features will be included as Nissan advanced airbag system with dual-stage supplemental front air bags with seat belts and occupant classification sensors, vehicle dynamic control with traction control system, intelligent forward collision warning, automatic emergency braking, blind spot warning, rear cross traffic alert, 3-point ELR Passenger seatbelt system, lower anchor and tethers for children, tire pressure monitor system, 4-wheel anti-lock braking system with electronic brake-force distribution system, and vehicle security system. This urban sporty aggressive style sedan car will be provided with an exceptional driving performance by fitted with 2.5 L DOHC and 3.5 L V6 engine powered by X-Tronic CVT Speed Transmission. The special price packages will be offered as S, SR, SV, and SL. Nissan Altima 2019 will be a super executive sedan car perfect choice for people having a desire to elevate an elite class high status lavishing and sophisticated lifestyle with a fast-paced smooth powerful and passionate drive journey experience.